These are now much smaller and neater than in the past and fit comfortably over the ear with a custom earmould worn in the ear. Because the components are housed outside of the ear, BTE aids tend to be the most durable, need less repairs and have a longer life expectancy. They can be worn easily, even with spectacles. These are housed in a tiny case that fits over the ear coupled to an ultra thin tube that fits in the ear. These are appropriate for people with normal to near normal hearing in the low pitches (bass tones), and a mild to moderately severe loss in the high pitches (high tones). Normally as a result of noise induced hearing loss (e.g. ex-military, factory workers, pilots) or ototoxicity. They are very comfortable, cosmetically appealing and reduce the occlusion effect some people may get by hearing their own voice too loud. These are the latest technology in size! They are smaller than the CIC as they are deep in the canal making it difficult for someone to detect them. This type is heavily based on the hearing loss degree and the size of the ear canal as it does not fit in all ears. These are also custom designed. They fit deep into the ear canal so they are not easily visible. They may also reduce the problem of wind noise. Additionally, due to exposure to moisture and ear wax, CIC need good care and cleaning. 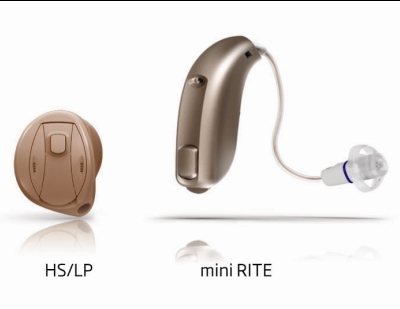 ITC’s are custom designed, small in size, and fit deeper into the ear canal than the in-the-ear hearing aids. They fit comfortably and securely in the ear. This is the best way to fit mono-aural hearing loss. This allows the person to pick up sound on the poor ear side and hear it on the better side making the person hear from both sides and localise sound easily!